We are not the same as Africans. Just because we share similar shades does not mean we are like them. There has never been a sign that we are their people, they never came and got us, apparently they forgot us. And they are definitely not trying to claim us as their own now. When I went to Africa, the Nigerians (who are West Africans) did not see me nor receive me as their own. It has been my observation abroad and at home that Africans depise us...there are some perhaps who do not operate within the white supremacist brainwash matrix. However, at large this conclusion stands for me. Additionally, they mock the term "African-American." Every African I've spoken to regarding this issue has relayed to me that the term "African-American" is ludicrous from their perspective. Our ancestry is in the East, in the land of Canaan, known as Palestine. In 70 AD, when Titus sacked our temple and enslaved us (because of our disobedience), about 1 million Israelites fled into Africa to escape the siege. Africa had been known as one of the safest places in the world at the time. 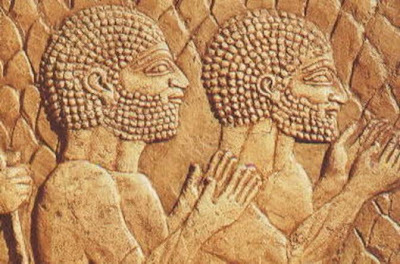 In fact, our people at been living there before the birth of our Messiah (Jesus Christ) centuries before. One of the oldest Jewish cities was Carthage, established by our forefathers before the destruction of the First Temple in 586 BC. We fled by foot and boat...that's how we got to West Africa. The Phoenicians, another Canaanite people, knew the secrets of navigation long before the Europeans did and brought us over by way of the Mediterranean Sea into West Africa. In West Africa, we blended with the black natives there and mixed with them. This happens all time with migrants. But wherever the Jews have gone they have caught hell, pardon the french. They were persecuted in their host countries, as well. This was mainly tied into the curses of Deuteronomy 28. Godbey, an old Duke University professor said this about us when we were in Africa, "These facts have peculiar significance when the presence of Judaism among American Negroes is to be considered. Hundreds of thousands of slaves were brought to America from this Western Africa during the days of the traffic, beginning nearly four hundred years ago." He also says: “How much more of Judaism survived among West African Negroes in that earlier time? As persecuted communities, they were rather more in danger than other Negroes of being raided by war parties and sold as slaves. (Did you catch those italicized parts...that piece is key right there.) It may be considered certain that many partially Judaized Negroes were among the slaves in America. (Dig that!) How many of them might still hold some Jewish customs in their new home is another question." (Godbey, p. 246) The further research affirms this to proof positive. 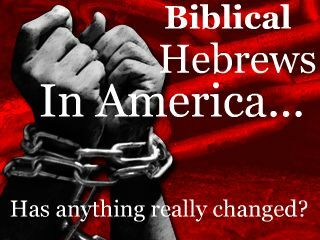 In fulfillment of the curses of Deuteronomy 28, our Israelite forefathers were sold into slavery. The Most High God relayed to our people through Moses, "And the LORD shall bring thee into Egypt again with ships, by the way whereof I spake unto thee, Thou shalt see it no more again: and there ye shall be sold unto your enemies for bondmen and bondwomen, and no man shall buy you. "(Deuteronomy 28:68) "No man shall by you" signifies that no man shall be able to restore us from our miserable condition. All the efforts of previous so-called "African-American" leaders have not been able to remedy our people's condition in the United States. Maybe you were here on these shores all along! 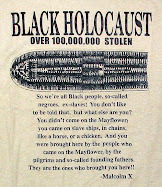 America has an indigenous black population & most black people were not bought to the Americas(Amhericas) as slaves. You are right. Your statement corroborates with the research of the late Ivan Van Sertima, who pioneered studies in uncovering the African presence in Ancient America. 100,000,000 Africans were lost in the Transatlantic slave trade so your statement that "most black people were not bought to the Americas(Amhericas) as slaves" is a huge understatement. Thank you for writing in.